This is a limited 1-day only sale that will expire tonight at midnight (Wednesday, March 16, 2011). Click here to buy now or for more information about the deal. Quantities are limited so don’t miss out! 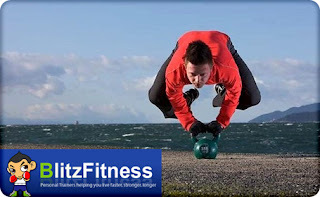 Blitz Fitness is a British Columbia based company that is dedicated to getting people as fit as possible. Health issues are not improving as quickly as they should. We want to change that statistic and change people’s lifestyles for the better. In order to excite people to start some kind of training, we make it easier than ever. We offer individual training with action plans and schedules designed to fit all needs, from the beginner to the experienced. We understand how busy schedules are and how hectic life can be which is why we believe in being flexible. We bring fitness to you, that way there are no excuses. We don’t believe in the flashy gimmicks in an attempt to trick people; we offer honest advice and real results. Blitz Fitness offers a variety of services including: Online Personal Fitness Training, Competition Training (i.e. body building, show, etc. ), Boxing, Core Conditioning, Sport Specific, Diet & Nutrition, Weight Loss, Crossfit, Aqua Fit, Individual / Group Training, First Aid Certification, Bootcamp, Promotional / Community Events, Composition Testing, Yoga on the Go, and Hummingbird Spa Treatments.